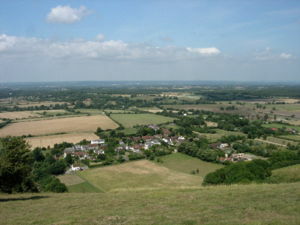 Sussex is a region in south-east England, on the south coast. As a political unity, it once was a county but is now divided into the administrative districts of East and West Sussex. It is bordered to the east and north by Kent, to the north by Surrey and to the west by Hampshire. More than 1,000 years ago the kingdom of Sussex had formed, the name meaning "South Saxons". It was later absorbed into the kingdom of Wessex. In 1066, the most famous battle in English history was fought in the county near Hastings, at a site now occupied by the town of Battle. William, Duke of Normandy, defeated King Harold to begin his conquest of England, becoming King William I (the Conqueror). Sussex has long been of strategic importance. The Normans built castles at Hastings, Pevensey, Lewes, Arundel, Bramber and Chichester. In the 12th Century, the coastal town of Hastings was amongst the original Cinque Ports, towns close to the continent which provided ships and men to the crown in return for special privileges. In 1264 a battle was fought at Lewes between the forces of King Henry III and Simon de Montfort. During the Napoleonic Wars, Martello Towers were built along the coast of the county as defence against a feared French invasion. Again under threat of an invasion which never came, the county was heavily fortified during World War II. For administrative purposes, the county is divided into West and East Sussex. West Sussex is administered from Chichester, East Sussex from Lewes. The city of Brighton and Hove is administered separately. Sussex has the oldest county cricket club in England, and is home to one football league club, Brighton & Hove Albion.